Today I decided to try out one of the interval runs that are part of the package I'm testing. Next week I'll have a go at some hills and perhaps a pyramid session too. It was difficult to control my pace. The stiff wind affected my time, so the first mile was run with the wind behind me at a much faster pace. I did a mile warm-up and cool-down, and then two fast miles with half-mile recoveries. I ran down to Splash Point today, circumstances having prevented me from having a long Sunday run. I am testing some marathon training schedules for the Garmin Forerunner for Runners World. There are schedules for heart rate or pace-based training, and as I've never made much use of heart rate information, I went for the pace-based ones. I'm not actually training for a marathon at the moment, but I don't think that matters. The schedules that would be most interesting to test are the interval runs and hill sessions, but I just did a steady pace five mile run today. Apart from some interval training, I haven't really used the pace feature of the Forerunner, except at the end of a run, so it was disconcerting to be beeped at. I was beeped at a lot, though I suppose over the whole distance it evens out. I was told to slow down more often than I was told to speed up. I ran before lunch to Splash Point, in stiff winds, and beside a high sea crashing on the shingle. I ran for 30 minutes up the hill beside the golf club. This makes me look more of an athlete than I really am. Thanks to AntBliss for the photo. I failed to do this in under 45 minutes but it was a glorious day, hard work, but enjoyable. The official results are up already, which is impressive. I didn't see Fatboy Slim or Ronnie O'Sullivan, but did see BSMS runner Claire Brooks. My gun position was 787th, my chip position 818th, and my gun position in my age group (men over 50) was 95th. I still think a 10k in under 45 minutes is a possibility, perhaps not so soon after a marathon. Now on to the Mince Pie Ten Mile. PS: there's a couple of interesting videos on YouTube put together by the CompleteRunningGuide. Fortunately I don't appear. Yesterday evening, unable to run as usual with the BSMS team at lunchtime, I ran my last run before Sunday's Brooks Brighton 10K, a short twenty-minute affair. I ran a short run tonight; down at Seaford front the wind was very strong. I realise that I failed to mark the third anniversary of this phase of running. 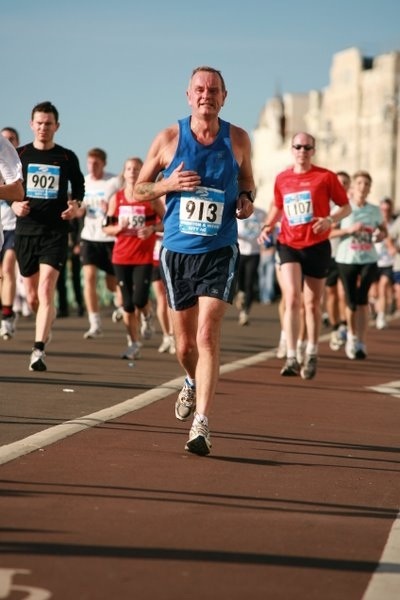 I started again in November 2003, inspired by a friend who entered the London marathon. This was before I owned anything as fancy as the Garmin, so I timed myself with a watch. My first outing was 30 minutes on a quite tough route behind the University, by the Westlain plantation, my second another 30 minutes, a double circuit of Canons Park in London where I then lived and my third 60 minutes up to the downs above Kingston and back. I did an early morning run on the reverse High and Over and Frog Firle route. Damp, grey and warm. I had no time for a long run this morning, so did a quick five miles to Splash Point and back on a dull dreary morning. 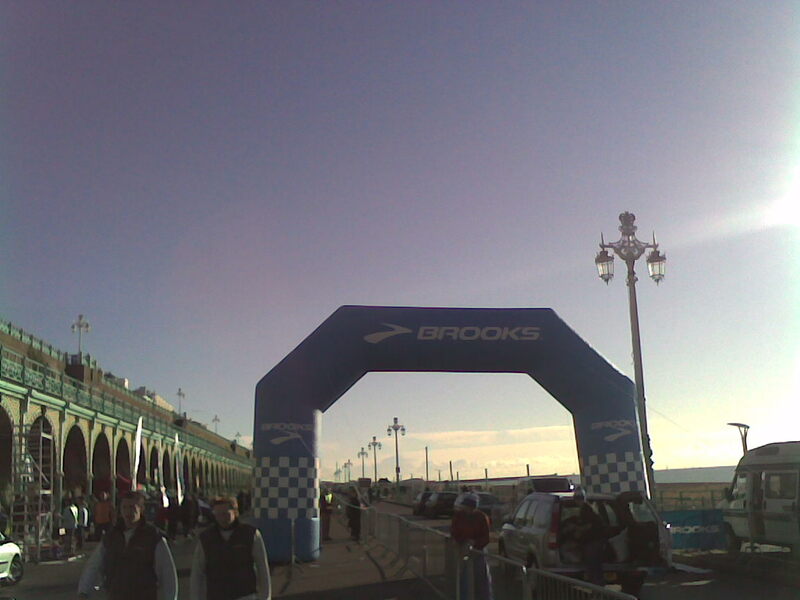 With one week to go till the Brooks Brighton 10K, I was not very fast or fluent, but I think I will manage on the day. My aim is to run it in under 45 minutes.